Bank Transfer getaway gives you the ability to allow your customers pay their purchases through a bank transfer. You will find this getaway settings on your WordPress admin area navigating to the GamiPress menu -> Settings -> Add-ons tab. To access to this getaway configuration you will need to enable it through the Getaways settings located at same settings box. Important: Bank Transfer getaway can not connect with your bank in anyway, so you will need to manually complete the payment when the customer do the transfer. You can use this getaway as a manual payment method for testing purposes too. Bank Transfer includes an informational text to show to your customers when they choose this getaway as a payment method. 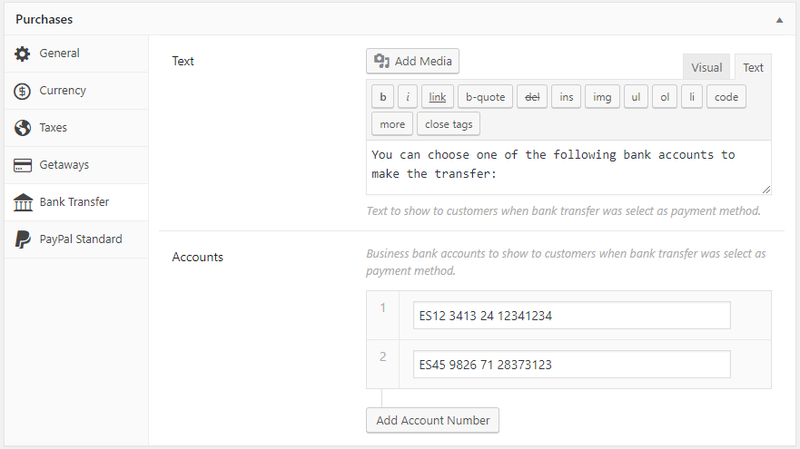 Also you have the possibility to define bank accounts to let your customer decide between them. On the payment edit screen you will see a new action to automatically mark the payment as completed by just clicking on the payment action. To process a refund on a payment with Bank Transfer as a payment method you need to set the payment status from “Complete” to “Refunded” when you really do the refund through your bank. In this way, all items awarded to the user for make this purchase will be revoked successfully.